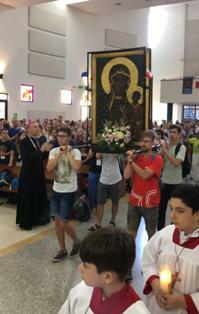 The Pilgrim Icon of Our Lady of Czestochowa arrived on Thursday morning of January 24, at the parish of St. Luke in the sector of Costa del Este, in Panama City, where the World Youth Day is being held with Pope Francis. 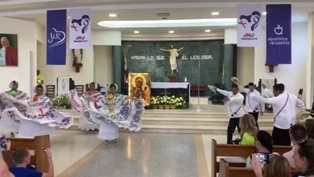 The Icon arrived from the Parish of St. John Bosco in the sector of Albrook Mall, where She was the previous day in a Holy Mass with Polish pilgrims. They met for a special concert night that was called "From Poland To Panama". The Parish of Saint Luke has also been designated for the catechesis of the Polish pilgrims, and it was very emotional that the Icon arrived here, since tradition tells us that Saint Luke the Evangelist was the one who wrote the Original Icon that is in Jasna Gora. The church was full of pilgrims, approximately 640 people. When welcoming Our Lady the Polish pilgrims sang Marian songs, while the Icon was placed in the center of the main altar and adorned with flowers. 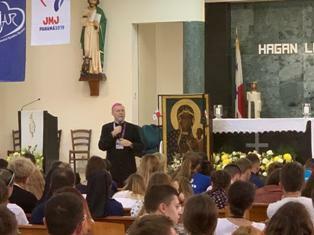 The catechesis began at 9:10 am and was given by Bishop Piotr Turzyński, who at the end asked everyone to raise a Hail Mary to the Mother of God. Then the Holy Mass was offered, which began at 10:45, two more bishops and 30 priests joined the celebration. At the end a lively Panamanian folk group delighted the pilgrims with a typical dance, causing many to get up from their seats encouraged to participate in the dance. On Friday the 25th the Icon departed for the Chapel of Saint John Paul II, back in the Albrook Mall sector.